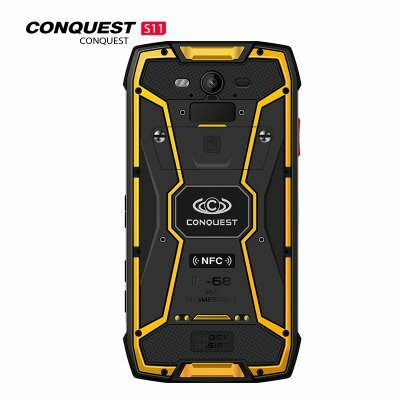 S11 has practical outdoor functions such as a compass, flashlight, heart rate, alarm bell, SOS, magnifying glass, pedometer, plumb bob, protractor, wall charter, spirit level, and noise test. Give your outdoor trip more fun. S11 is equipped with a 7000mAh high-capacity high-voltage polymer battery, safe and durable, so you no longer "panic" for electricity. 4G+ VOLTE Full Netcom 7 Mode 25 ( supports North American band ) dual card dual standby, the main card supports mobile Unicom Telecom 4G/3G/2G and mobile 4G+ networks, the vice card supports Unicom 3G network, mobile telecommunications 2G network main and auxiliary cards are free Software switching. S11 can be charged by using magnetic holder charging, magnetic wire charging and USB data cable charging, etc.